Shopping for a new dishwasher can be a daunting affair, especially if you’re buying one for the first time. With growing technology and innovations, a dishwasher is not as elementary as it used to be. If you walk into a store that houses modern kitchen appliances, you’ll be inundated with the myriad of options available. So, how to choose a dishwasher for your kitchen? And, the right one? Don’t be bogged down by the task. Let us help you through our complete guide on how to choose the best dishwasher for your kitchen. The first step is to narrow down your options through factoring in the price range. The good news is that while there’s a correlation between price and performance, it’s not considerable. You can find a decent dishwasher without burning a hole in your pocket. So, don’t lose heart if you’re on a strict budget. There are competent dishwashers out there that can be owned for $500 or less. If you are willing to spend anything between $600 to $900, a nice mid-range model – with most of the essential features – will be well within your reach. Once you go beyond $1,000, you can look for a model that has everything you could ever want. The next major point to consider is your requirement in terms of size and capacity of the machine. Are you a big family? Do you cook mostly at home? Do you use bigger pots and pans than usual? If you answer yes to any of the above, you must go for a bigger dishwasher that caters to your daily needs. A typical one might range from 18 inches to 24 inches wide. The latter is generally the standard size found commonly. But don’t be fooled by the outer body. The actual capacity of the machine may belie its measurements. 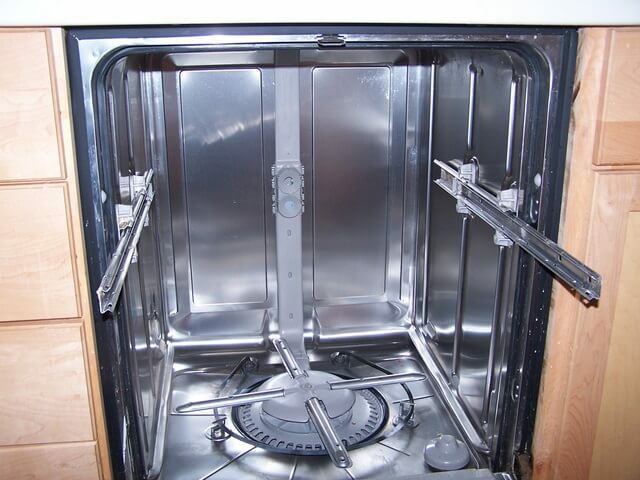 Carefully look at the interior of the dishwasher you plan to buy. There should be less space between the tines so that you can fit more items. The best offering would be with foldable tines that happily accommodate differently sized dishes. If you are of the opinion that any and every dishwasher will be able to clean and dry dishes satisfactorily, you have another think coming. Not all dishwashers do their jobs well. To save yourself from being disappointed, consult Consumer Reports and choose wisely. Look for cleaning and drying settings that suit your needs. For instance, if you wash your dishes before putting them in the dishwasher, you need a machine with basic cleaning settings. If you don’t, then choose a model with heavy scrub setting. You don’t want to end up running extra cycles just to get the leftover food particles off your dishes. As far is drying options go, most conventional dishwashers make use of a simple fan system. The fundamental idea is to move the air present inside the dishwasher and aid in evaporation. It is a simple technology. It is also the least effective. You may also find a heating coil in most machines, ensuring that the circulated air remains warm. This leads to better, consistent results. The best option for you is to look for an air-dry feature. If you have the option to turn off the heater and switch to air dry, you’ll save up on electricity. And save dollars on your utility bills. The most common mistake a householder makes is to run the dishwasher on the same wash cycle everyday. Don’t. Different occasions need different settings. Look for a dishwasher which has a combination of cycle and speed selections. Normal – The default setting that is ideal for a full load of dishes with the usual amount of soiling. Auto – An adaptable cycle time to suit a mixed load. It makes use of the machine’s sensors to detect how dirty the dishes are and work accordingly. Express or Quick Wash – Perfect for lightly soiled dishes or a smaller load. It has a quick turnaround time. High-end dishwashers may have fancy variants or combinations such as Energy-Saving, Rinse-Only, China, or Gentle. There are also models with Sani-Wash available – to heat water to sanitizing temperatures, perfect for cleaning baby bottles. Choose the best option. Make sure the machine you’re considering has the cycle you want. It makes more sense to pay a little extra for an energy-efficient model. It’ll do you good in the long run. 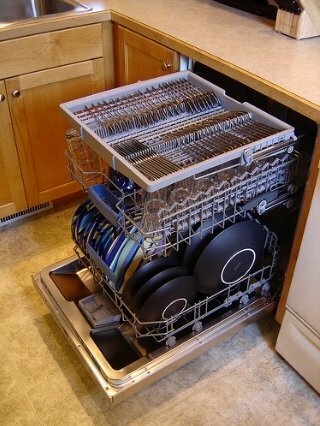 Such dishwashers are not only good for the environment but also help you save a tremendous amount of money. As per the Environmental Protection Agency, an ENERGY STAR-certified dishwasher can save you up to $35 a year in utilities alone. And, you can conserve 3,870 gallons of water over a dishwasher’s lifetime! A win-win situation for everyone. How do you find a dishwasher’s estimated energy use and cost per year? Easy, it’s marked on the yellow tag at the front of the machine, along with its rating. Make sure you buy Energy Star-certified models built under the latest standards. For more help, visit the ENERGY STAR website. What follows logically from the above point is the fact that you need a dishwasher with good soil sensors. The significant feature checks the water quality after every phase of rinsing, irrespective of the kind of cycle you’ve chosen. If it senses that the water quality is clean, it’ll move straight to the drying setting. Even if you’ve selected a longer cycle. Efficient, isn’t it? Saves water, saves time. A dishwasher’s noise rating, more often than not, does directly correlate with its price. Expect the cost to be up if you go for a whisper-quiet model. Having said that, the good news is: even low-end models are considerably quieter than the old, headache-inducing machine which our parents possessed. 50 dBs or more – Mostly in low-end machines. Not loud enough to wake up a sleeping child in an upstairs bedroom but also not the ideal noise level. Mid 40 dBs – You’ll still be able to hear it when it’s at its loudest but you should easily be able to talk over the sound. Low 40 dBs or lower – Audible during the loudest part of a wash cycle but you’ll barely be able to hear it even if you’re in the same room. Perfect for those who’re particularly sensitive to loud noises. Look up your dishwasher’s sound rating. Search the model number online and glance through its specs. Decide according to the location of your dishwasher. After all, if the kitchen is where you get together to discuss your day, a grinding sound emanating from your dishwasher will be quite unwelcome. There so many models of dishwashers, with similar features in the market that choosing the best exterior gets a little tough. Worry not. Look at the dishwasher you’re considering and see if it’s love at first sight. Jokes apart, there are various selections to choose from. The classic and simple white, the contemporary stainless steel, the chic black, or the colorful one for a funky, retro look. You can even go for custom panels which are necessary if you want your semi or fully integrated dishwasher to match the rest of your kitchen. Control panel is another aspect that needs to be looked at. It’ll either use physical buttons or digital touch controls. Digital controls are less bulky. Ask yourself a few questions. Does the panel display your choice of wash cycle? Also, look for a time display on the control panel. Make sure it estimates the time to complete a cycle. 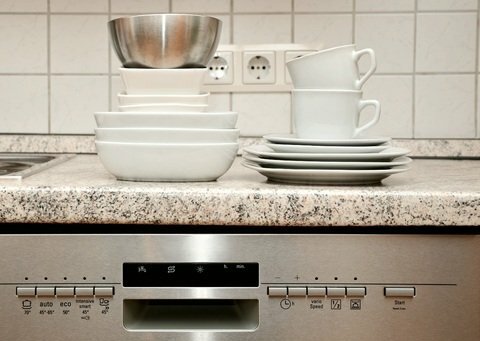 You may want to find out if there are unique additions to the dishwashers you are thinking of buying. Some features might be specific to a model. For instance, it could have an extra adjustable rack, multiple jets to help water reach into those smaller, hidden spaces, lower maintenance cost in terms of filter warranty. Once you find a few dishwasher models you like, read their reviews before you make the final choice. We’re certain, you’ll choose well. Picking the right dishwasher is not as intimidating as you think. Equipped with our list of factors, you’ll know how to choose a dishwasher for your kitchen. Sort through the rows of similar looking options and find a dishwasher that meets your family’s needs perfectly. Happy Shopping!